Now on to this week's manicure! 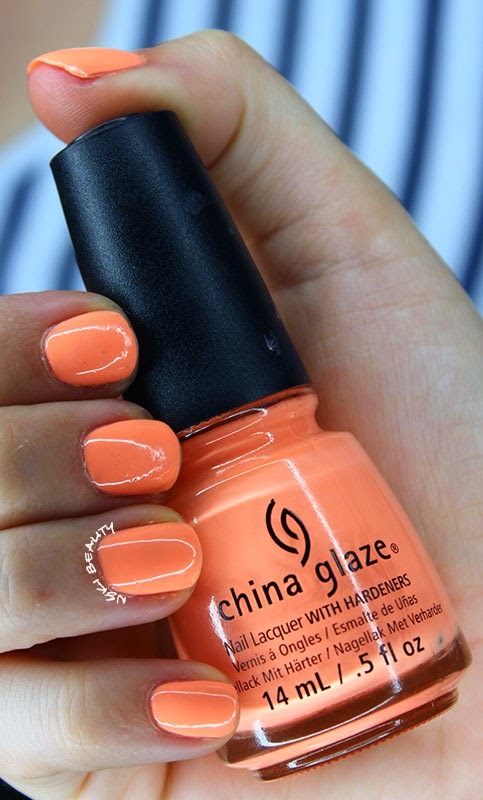 On Saturday I was wearing a pastel / neon orange sorta coral shirt and was telling my husband how I really wanted to paint my nails that color (and a purse while I was thinking of it LOL) and much to my surprise I actually had a nail polish PERFECT for it, China Glaze's Son of a Peach! I absolutely love the color, however I found the formula was a bit hard to work with! It is definitely one of those polishes you have to give time between coats and you definitely need 2-3 coats to get even coverage and to top it off my INM's Out the Door decided to be a jerk and leave air bubbles on my nails. Regardless, I am still please that I found the color and love that after some patients and multiple coats the polish looks exactly like it does in the bottle and is a fun bright polish without being to neon for spring.